For those who went to the Boston Symphony concert to hear Music Director James Levine conduct Mahler 9 on last evening, February 26, the announcement that the ailing conductor (whose health issues have so unfortunately been featured in the news more prominently than his recent musical achievements) had canceled his appearance was truly disappointing. Managing director Mark Volpe came out on stage to explain that Levine “recently had a procedure to address his ongoing back issues” and “is experiencing some complications which have been further exacerbated by a viral infection.’’ Without a doubt, this announcement has implications that go far beyond this week’s scheduled performances of the Mahler 9 and puts in question the Levine-heavy remainder of the current season and his tenure at the BSO as a whole. It was perhaps especially disconcerting for those who know, remember, and love Levine’s magisterial performances of Mahler symphonies over the course of his time in Boston as well as for those who would like to see Levine get well and persevere as BSO’s music director. Many will have etched in their minds his inaugural concert, in which Mahler’s 8th, “Symphony of a Thousand,” moved the audience to a state of exaltation. For this writer, that performance was what NPR calls a “driveway moment,” where having arrived at your destination, you are so captivated by the radio program that you remain in the car to finish listening — in this case, to a live broadcast from Symphony Hall. BSO Assistant Conductor Sean Newhouse, having been literally thrust onto the stage on half-a-day notice and having barely had one prior rehearsal with the orchestra on this ninety-minute behemoth of a symphony, could not have found himself in a more difficult situation. The same was true for the symphony players, who at times looked and sounded disoriented (though Principal Flute Elizabeth Rowe contributed a stellar solo at the end of the first movement). Newhouse made out bravely and without losing face, despite his inability truly to get a handle on the piece until the very last movement, a whole hour into the work. It would be unjust both to Newhouse and to the members of the orchestra to go through the list of things that did not go right in yesterday’s performance. These ranged from basic difficulties with technical execution and ensemble to more complicated issues of musical content, pacing, and architecture. Newhouse often conducted with energy and movements of a bandleader — clearly in an attempt to stay on track — without missing a beat, but failing to show musical gestures and to find emotional rapport with the orchestra that itself at times seemed reluctant to bridge the gap. Without making allowances for his young age — which seems less appropriate to this writer after witnessing the versatility of, say, Gustavo Dudamel (Proms) or, to bring it a bit closer to home, our own Joshua Weilerstein (YouTube) — it was surprising to see the conductor remain so aloof to the wide gamut of mental states, from euphoria to utter desperation, that inhabit this last completed symphony by Mahler, a work that ultimately deals with loss and death. In this context it was thus even more surprising to see Newhouse suddenly step up to the plate, both intellectually and emotionally, in the final Adagio, a thirty-minute hymn to life (and death) eternal, a piece of music which requires more depth and maturity than the preceding three movements. Suddenly the orchestra started to respond, with Concertmaster Malcolm Lowe for the first time in yesterday’s performance playing as only very few can. Principal Cello Jules Eskin and Principal Viola Steven Ansell, with woodwind and brass players too numerous to list, contributed with beauty of sound and depth of feeling. At that point it was only the constant noise from various objects falling down on the floor in the hall itself that occasionally disrupted the masterfully set up atmosphere of Mahler’s final masterpiece. Ed. Note: Sean Newhouse will be substituting for an ailing James Levine on Saturday, Feb 26 and Tuesday, March 1. He was to have made his BSO debut at Tanglewood this summer. Constantine Finehouse is Boston-based pianist, teacher and recording artist. His latest CD, “Backwards Glance” features the music of Brahms and Beaudoin. Finehouse is on the faculty at NEC’s Division of Preparatory and Continuing Education. His website is here. It really appears that Levine’s constant medical problems place both the BSO and the Met in an extremely seious situation which greatly effects the remainder of this season and next for both institutions. It is obvious that Ms. Finehouse is totally unaware of the truly great young…(age mid 20’s to mid 30’s) young conductors both locally and internationally… Courtney Lewis age 27 of the Discovery Ensemble (the gifted Josh Weilerstein is his concert master)… Yannick Nezet-Seguin new music director of The Philadelphia Orchestra. Vasily Petrenko who made a sensational guest appearance with the BSO and made the Royal Liverpool Philharmonic one of the world’s great ensembles..he’s just been appointed (last week) as new music director of the Oslo Philharmonic effective in 2 years) and Ludovic Morlot who was assistant conductor of the BSO until the end of last season are just some of the truly gifted young conductors. I resent it when people mention Dudamel as a great conductor because while very charming and ego-less.. ..fast tempi and loud playing as well as looking great on the podium is not interpreting music… the very thing that Ms. Finehouse berates Sean Newhouse for not doing. I’m looking forward to Tuesday’s BSO concert and the Mahler 9th.. I too wish that Levine is on the podium. Not to devolve this thread into a Dudamel-evaluating war, but to say that Gustavo is all about fast tempi and loud playing is a gross misrepresentation of his abilities. Also Joshua Weilerstein is a fast-rising conductor as well as being the concertmaster of Discovery Ensemble under the terrific Courtney Lewis. The other phenomenal young conductors mentioned by Mr. Burke are noted, but I don’t think that was Mr. Finehouse’s point. I believe Mr. Finehouse was merely saying that in comparison to Dudamel and other young conductors, he felt that Newhouse missed the mark. Why must we “resent” the opinions we disagree with? I was at Thursday’s performance, too. I wonder if Mr. Finehouse was at the same performance. Yes, I was disappointed that Maestro Levine was not conducting. But…Mr. Newhouse took on this performance with a BSO orchestra that was with him in bringing us a performance full of electricity and excitement. He settled and they followed. Where were youm Nr. Finehouse, when the oboe gave us the incredible ending of the first movement, or the Trumpet solos that so completely morphed into he strings later on? Of course this wasn’t what Levine would have given us, but I found Thursday’s performance incredibly exciting. I could not have wanted for more that evening except a quieter audience at the end (there are always those that must leave early and their things drop on the floor, shame. I returned Friday afternoon and found a more evenly performed Mahler’s ninth, albeit with a pocket book nehind me that kept opening it’s zipper and then closing it and programs that kept rustling,(Their owners should read Alfred Brendel’s poem “The Coughers of Cologne”) but most of the audience was with out young conductor and so was the symphony. Even for the more settled performance on Friday, I preferred the electricity of Thursday night, when our -what must be the best symnphony orchestra in the world, gave all it had for it’s young conductor. Constantine Finehouse wrote: whose health issues have so unfortunately been featured in the news more prominently than his recent musical achievements. Unfortunately it is what it is. Last season I was given away my BSO tickets and today I am wondering of it I need to drive to Boston and to play those humiliating parking games if Mr. Levine won’t be there. Let face it, with Levine not there BSO plays differently. I do not mean to demean other people who took Mr. Levine place and BSO did yield some seldom great results without Mr. Levine. Still, I am egotistic in my consumptions of sensations, I love Levine and I would like to hear M9 with James Levine, not only with Levine but with the orchestra the he had chance to prepare extensively. Absolutely agree, interpretation-wise most of his conducting efforts have very little value. Ben…agreed re: Why must we “resent” the opinions we disagree with? I do get “carried away” re: Dudamel… I wanted so much to like him as a conductor because of his winning ways but with a live concert and endless listening to cds and “You Tube”, I haven’t changed my original view. His true value lies in his ability to bring new listeners into the fold of classical music…an effort which is invaluable! I wish that Ms. Finehouse would listen on You Tube to some of the young condustors I mentioned. Now one can hear and see a few complete..40- 190 minute performances without breaks… Nezet-Seguin’s revelatory Nutcracker and Petrenko’s Tchaikovsky # 5 for example. I hope Ms. Finehouse and others will attend The Discovery Ensemble’s March 17th concert at Sanders and “discover” how a brilliant young conductor, Courtney Lewis, interprets music and inspires his young musicians to play better than they think they can. Does anybody at Symphony Hall have Ben Zander’s phone number? 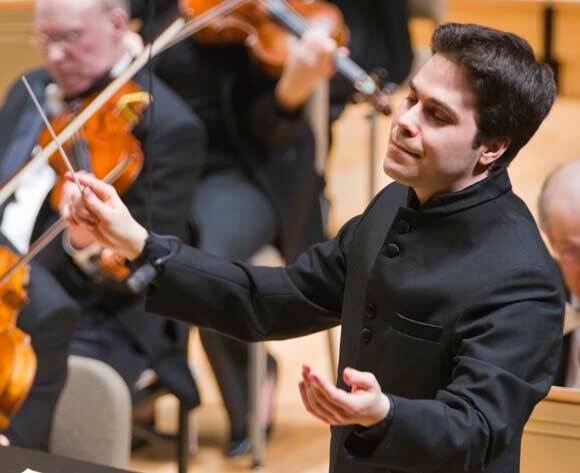 The BSO in typical fashion probably denies that Ben Zander and other local conductors and musicians not directly involved with them even exist. Good Luck… Ben is usually quite accessible to people. Sorry Mr. Finehouse…for the gender mistake… very careless on my part… I blame it on age and dying brain cells. I’d like to chime in on Laurence Glavin’s and Ed Burke’s comments about not searching out other conductors around town. The BSO has an absolutely abysmal record of relating to the many fine conductors and musical institutions in the area. It’s a serious case of “not invented here” syndrome that needs to be fixed. Having said that, however, it should be noted that Ben Zander was (and is) busy this weekend conducting the BPO, so even if he had been asked he couldn’t have done the job. There are those who have wondered whether he would be up to the job if he ever had to conduct a world-class orchestra (pace, Romy) like the BSO, but of course we’ll never know unless they try (and I believe BZ has conducted one or two of the major orchestras in London). And what about Hugh Wolff, also just down the block, who has a well-established international reputation? There have for many years been really good conductors in Boston whom the BSO has snubbed–Tom Dunn comes to mind. For the most part, what these conductors seem to have had in common was that they were Americans. The BSO should make a point of having top Boston conductors come in as guests. This is an important musical city, but it sometimes seems that the BSO thinks it’s the only reason for that. Last evening at dinner I was talking with my brother about having Newhouse step up for Levine at Thursday’s concert, and it occurred to me that since I do not have Mahler’s Ninth in my ear, I would not know if a conductor — Levine, Newhouse, Nézet-Séguin, Lockhart, Zander, or whoever — was bringing forth some special interpretation of a note, phrase, or passage. It’s the same with most of what I hear at Symphony Hall. I hope I’ll hear something interesting and musical, and I hope it will follow the score. It’s nice, in the few pieces that I’m more familiar with, to occasionally have a moment where I can hear an interesting, even brilliant new way of taking something, and it’s sad when a passage lacks a quality — verve, rapture — that I’ve come to expect, but for me, a generic “Eroica” Symphony or “Emperor” Concerto is well worth hearing. I would hope for those who love Mahler’s Ninth a workmanlike performance is equally enjoyable. Whether the BSO performance was standard or substandard, I have no idea. All I can say is I liked it as it was, that is, I thought it worth hearing. Also, I do found the Joe Whipple’s comment that he would not say who played Levine or Newhouse were a bit exaggerated but emblematic. BSO does not have for years own “signature”, recognizable sound and we in Boston do not have musical director who impose a long standing-will, would it be chromatic or punctuation will. It is not that BSO is disable to throw a good play once a while but when I buy the BSO tickets I hope that they are not the same as the Mass Lottery tickets. Romy the Cat raises the interesting point of orchestras having a signature sound. Doubtless, it was more likely to happen before air travel made it possible for conductors to wander the globe, and hence for orchestras to greatly increase the number of guest-conducted performances, with a concomitant decrease in the number conducted by the music director. I hope the editor, executive editor, publisher, or some combination thereof will invite a number of people to contribute to a “virtual” round table on the question of how desirable it is to have a signature sound. Should a listener to a recording be able to tell readily, “That’s the BSO,” “That’s Levine,” “That’s the BSO under Levine,” “That’s the BSO with a guest conductor,” “That’s the Philadelphia,” “That’s the Met,” etc? Should the BSO have the same signature sound in Beethoven, Brahms, and Babbit (if they disregard Babbit’s admonition that his music isn’t for the regular concert hall audience)? Should they sound different in Brahms and Beethoven, even if the orchestration were comparable; i.e., is there a different way Beethoven and Brahms should be played. If so, should it override the signature sound? Should Boston in Brahms sound more like Philadelphia in Brahms or Boston in Beethoven? Is it really important to hear Levine or Boston when we’re hearing Beethoven? Mind you, at this point I’m talking about a signature sound, not the depth of interpretation. What do our reviewers think? What do Joel Cohen and Benjamin Zander think? Joe Whipple raises important questions. It’s probably true that a music director who conducted more than 60% of an orchestra’s season would eventually give an orchestra a recognizable sound or personality, which would tend to color both how that orchestra performed most composers’ music, and how that orchestra responded to guest conductors. It’s also probably true that an orchestra that is more flexible, more able to produce whatever sound, balance, or style is called for by a conductor or composer, is less immediately recognizable by its personality. One can lament the disappearance of national styles of playing, however, without also wanting all music to sound alike, or to be stamped with the interpretive preferences of a single conductor’s personal taste. Music performance is a re-creative art. “Just playing the notes” isn’t enough: they have to filter through a human heart, a human mind, and be aimed at the understanding of a human audience. Most of the time, though, a symphony orchestra shouldn’t pretend to be a chamber ensemble, so rather than try to be the sum of all its members’ personalities, it should usually be responsive to whatever its conductor asks for. And that means, in my opinion, that it should not have a signature sound. It should strive for the sound imagined by the composer, as re-imagined by the conductor, in our current culture. I would disagree to recognize orchestral signature tune as some king of ever-present coloration. Mengleberg and Van Beinum had it with Concertgebouw, Furtwangler had it with Berlin (not with Vienna), Mravinsky had it with Leningrad, Toscanini had it with New York Philharmonic and partially with NBC, Golovanov with Bolshoy, Ormady with Philadelphia, Talich and Karel Ancerl with Czech, Koussevitsky had it with Boston, Szell with Cleveland Orchestra (not with Concertgebouw or Vienna) and many others. Vienna Philharmonic has own in-house celebrated sound that beamed through any conductor that who lead them. Weingartner, Scherchen, Krauss, Giulini, Rattle, Carlos Kleiber, Schuricht, Böhm all of them played Vienna but I do not think you would say they that lost own identity being submerged in Vienna “coloration”. I feel that “signature sound” is great if it properly used. The “signature sound” was something that allowed somebody like Von Matacic to step at the podium at Prague Philharmonics in 1967 and throw for instance Bruckner 7 with tonal qualities that were never were seen before or after. The problem that I see is not in “signature sound” but in the introduction of “international” pay where everyone pays the same. It’s official: Jame Levine will NOT be conducting any BSO performances for the rest of the regular season (including tour dates); Tanglewood is still indefinite, but I wouldn’t bet the ranch on it (I do not live in a ranch). It’s official but I cannot disclose- Birtwistle is in town and his premiere will take place, but the name of the conductor is embargoed until tomorrow. The Tuesday BSO concert was one of the strangest I’ve ever attended. It didn’t sound like the Mahler 9th or Mahler period. The volume level was so often fortissimo to the point that it rivaled Scriabin’s “Poem of Ecstasy”! Much of the time the tempi were too fast. Newhouse kept the orchestra following him effectively… albeit a couple of botched entrances and sour notes. The orchestral playing was generally quite good except for the dreadful horn playing. There were occasional passages of great beauty and insight. The performance was never dull but there was no overall sense of architecture in Newhouse’s conception of the work. Yet his interpretation, limited as it was, had a strange fascination. The audience was quiet and attentive until toward the midpoint of the last movement when a small epidemic of coughing and seat dropping began. The ovation was long and enthusiastic. I can’t recall a performance of a standard, familiar work at a concert to which I could not decide whether or not I liked it! This is so unlike me that I was shocked. WBUR just announced that Levine is stepping down before the fall sison and BSO initiates a search for a new musical director, something that they need to be doing for last 3 years. Bring David Robertson from St. Louis to Boston!!! I agree, David Robertson is the most talented and savvy conductor of his generation. Riccardo Chailly would be a fantastic choice..now there’s an outstanding conductor who receives rave reviews for his great INTERPRETATIVE gifts! Another enjoyable and insightful commentary by Constantine Finehouse, in my opinion although I was not in attendance! I can understand an inexperienced conductor’s depending entirely on himself, making a considered decision to maintain at least a strict count, the better to hold the intense work together. This could easily happen in the light of his understood self-doubt or self-consciousness in such a spotlight. What would explain the inspired final movement? Like a seasoned virtuoso artist, he albeit apparently spontaneously while in action, got the Light and called upon it to work through him and bring the work to a glorious conclusion. My other explanation would be that from the Spiritual realm, the composer himself may have been unwilling to let his own work go down to ignominy and may have rescued it himself by directing the baton as needed. I venture to say that with this new understanding that music has an accessible universal dimension that complements one’s own knowledge, we will hear great things from the debuting conductor in the future. I just noticed this article, with a video, on the Globe’s website. It’s based on an interview with Sean Newhouse, and it gives a bit more detail on the way the eight days unfolded. I guess it was to be expected that he would grow in confidence as he conducted it in successive performances, but it’s interesting to read and hear how he puts it. One counterintutive thing is that people thought he came into his own on Thursday with the fourth movement, and that’s the only one he hadn’t rehearsed with the orchestra.